This is the project I was wanting to light up. I had a Styrofoam rotor that I hooked up with LEDs from an old computer and a coin battery and, before it crashed and burned, really looked cool spinning in the sky at night all lit up! I'll document it as I go and if it actually works I'll post the steps. The end disks are going to be about 30 inches around and the whole thing should be about 4' long. I've only made a couple of kites before, at MAKR, so it should be a fun trip! That looks like it would be cool, especially with LEDs! Where do you attach the lines?... at each end (to the sides)? i wonder if anyone has made any sort of Ferris Wheel oriented kite?... that would be very cool, i bet! Got my first end done! Making the pattern was quite a trip! The lines attach on each end where the central spindle sticks out. I'm hoping that three or four inches of clearance is enough to keep the lines off of the disk. Looking good! It looks larger than 30 inch circumference. I suspect that you could put a spreader in the bridle line just in front of the vertical parts of the rotor. Not sure how you would fasten the spreader, though. That should be easy to figure out, I would bet. Yup, I should have said 30" diameter. Hey, since I have your ear on the subject, do you think I could skip the spreader if I put a long enough bridle on it? I have no idea if it will even fly yet and I'm looking to conserve weight wherever possible! Kiteguys right, that looks about 6' tall in the pic. Took me awhile to figure out where the other half of your sewing machine was. The kite is hanging from a ceiling beam about 3-4' closer to the camera then the table. I've been to their house. That beam will hold magnets and is the coolest place to hang kites. Looks great Rick! Wonder what time elapse pics will look like of it light and spinning at night. Grand Haven count down...8 days, 7 hours. ... do you think I could skip the spreader if I put a long enough bridle on it? Yep, if the bridle is long enough. Just how long is the question. I, too, am not certain if it will fly. 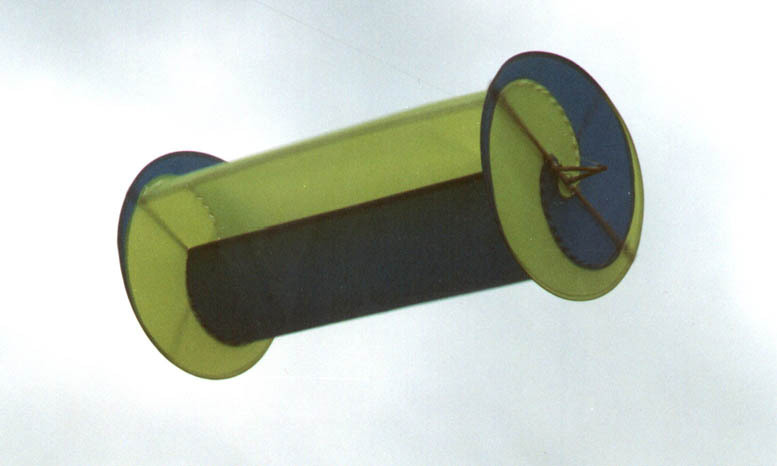 The only rotor kites I have seen were about 10 in. diameter, (I have seen one that is 1 inch diameter) and they spun like a dervish in order to maintain flight. Flight was at a rather low angle. However, it did not look like they should fly at all! If it does fly, though... it mystifies everyone that sees it! This one i have to see! i like the yin-yang design too! figure out when I need to fly for the press. Cub scout kite derby this Saturday First, I need to straighten out the pilot line one of the City guys rolled into a softball for me. Do you see a theme forming here? Not sure if he does, but I do. What ever it takes to spawn that sewing bug the better. Cant wait to see it out in G.H. There is a theme in that it matches something regarding the kite that you won at the auction at Lake Storey!... which is a worthy theme IMHO! Al, don't forget to let us know when it's time to help with packing! i'm really ready for G.H. too!... though i'm sure most other IKE members that are going are just rather indifferent about it. Both the good and the bad news is that the big kite field will be really crowded this year. The good news is that we all help each other, the bad news is that we will really be hurting for space. Work on the spool progresses. I thought I was almost done....till it actually got in the wind. It needs some tweaking....lots and lots of tweaking! The disks tend to deform with higher wind (like 6 mph!). Proposed solution, The end cross piece isn't in place yet, that should provide more support. Hey, is 10 spars too much for a kite? Plenty of time, GH is two days away! It looks good. You'll get tweaks figured out. Winds, usually die down at night. Not sure if that happens near the lake, tho. i think i'll soon find out what it is like to be a grasshopper in an old fashioned lawn-mower! We're having issues, my kite and me! I think I went too far in reducing weight, the thing actually flew but it basically flattens itself out in the wind and flops around. I'm hoping that it's the 20mph winds outside right now and not a total failure! I also can't get it to actually rotate....I think the sails are too big. The back side of one flattens out and catches the wind before the scoop side of the other can take over. I'll keep working on it but I doesn't look like it's going to make GH. I may be a little pessimistic, I was up till 2 working on the spool monster so it's hard to tell! bummer. Maybe Chris will have some ideas. I know he made one, but I don't remember out of what materials. I know it wasn't as big as yours.